I can not say enough good things about The Artisan Shop! Working with Christian to bring our ideas life was just the best experience we could have ever asked for. 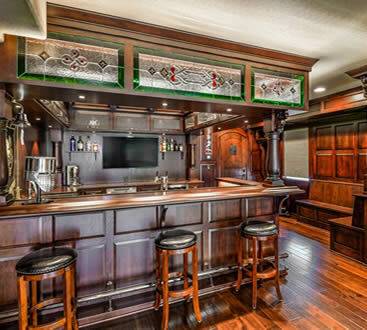 We wanted a basement renovation that included a Scottish/Irish Bar. We had just completed a trip to Scotland and Ireland and believe me, we had ideas! Christian Renger was completely open to our ideas and together we designed a stunning bar and entertainment center in our basement. Everyone we worked with at the shop was talented and professional. I had heard nightmare stories about remodeling, but experienced none of that with the Artisan Shop. Our basement looks like it was built by craftsmen, not just generic looking cabinets and built ins you would get at other shops. No one will ever have a bar that looks just like ours. No one could ever be as happy as we are with The Artisan Shop!